I've been a regular user of the task-tracker Toodledo and their iOS app for several years now and one limitation that I run into frequently is that the app does not provide a way to create multiple tasks in a single entry. First, in Toodledo’s web application, enable email importing for your account (see the help page at https://www.toodledo.com/info/help_email.php). Then in the Workflow app create a workflow which splits input on the new line character and for each input line sends an email to your secret Toodledo import address using the input line as the subject line of the email.Then import that work flow into the Drafts app using the Add to Drafts option in workflow’s settings. 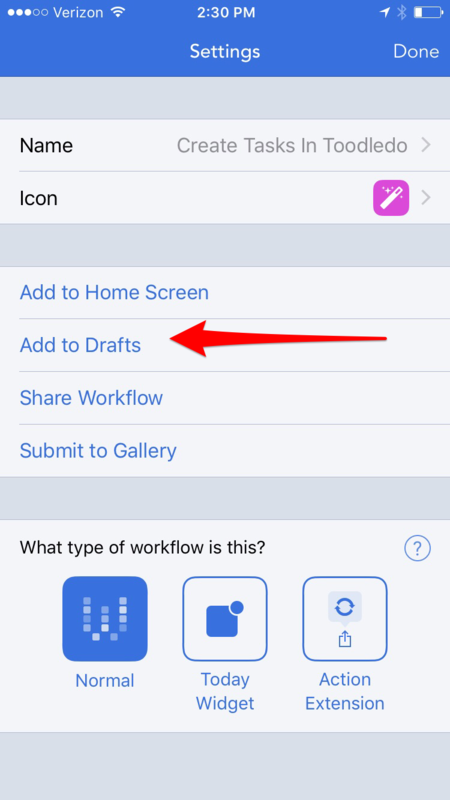 Worklow app settings page showing Add to Drafts option. Once this is all set up, when you want to create a set of tasks in Toodledo from your iOS device, simply create a new draft with each task on a separate line and using the standard email import notation in Toodledo to set priority, the folder, star the task, etc. Test task creation with priority !! !